Monty and I headed to the Lower Gorge today so see what was what and after about 10 mins of getting confused we put the guide book away and just climbed waht we though looked good! There are clearly some routes that the guide book mentions that have just not formed this year and a whole pile that are not in the guide book that are great. So my top tip would be find some ice and if you like the look of it have a bash! There are plenty of tress to ab off at the end of your pitch. We had a great day climbing 5 pitches of great ice between WI 3 and WI 4 all great fun. It has beeen snowing all day here and the roads are very white! Having a day off tomorrow befor dropping Monty off at the airport and picking clients up. Looks like a nice forecast for next week and it is certainly nicer out here than in Scotland. I am out in Rjukan in Norway with Monty at present, we have 4 days play before I have a weeks work. After a fairly long but uneventfull journey from Moray we have been having a great time ice climbing. The weather so far has been cold and snowy and it seems that many of the routes are a little thin or not formed, however there is still loads to climb and it is certainly the arms that give in before your run out of routes for the day! We have spent our time checking out some crags and brushing up our technique. So far we have visted Ozzimosis, Upper Gorge and the Vermork Bridge areas with the plan to head to the Lower Gorge tomorrow. Looks like it is going to be slightly wamer as well over the next few days as well. The mountains of the UK are remote, technical and exposed to harsh and unpredictable weather. This makes them a hazardous place for novice walkers and the ML is designed to help responsible leaders who wish to operate in mountainous terrain in summer conditions. ML courses develop your group management skills, the ability to navigate in all conditions, the ability to deal with mountain hazards (including steep ground) and increase your awareness of environmental issues. There is an expedition element to the scheme. The Mountain Leader scheme is overseen by Mountain Leader Training UK (MLTUK). The course follows the MLTUK syllabus and comprises full practical days out in the mountains and evening lectures. Day 1. Introduction to the week and what is expected of a Mountain Leader and an introduction to navigation techniques. We will be out and about on a local hill and in the evening there will be a ropework session. Day 2. A steep ground day, concentrating on skills that are required to safely use a rope in unplanned situations. In the evening there will be a presentation on mountain weather and our understanding of what we need know about it as an ML. Day 3. Our journey and leadership day. Today we will be looking at route choice and group management in various types of terrain. In the evening there will be an opportunity to ask plenty of questions during our "What Comes Next" session, and how best to prepare for assessment. Day 4. In the morning we'll cover Emergency Procedures, Mountain Rescue and Medical Emergencies followed by a wet session in the afternoon with a River Crossing workshop. There will be a discussion on The Outdoor Access Code and what it means to us before having the rest of the evening off to pack for our expedition. Day 5 & 6. An overnight camping expedition with a focus on environmental input and navigation. There will usually be a night navigation exercise. Course will finish by around 5pm. I offer this course in conjunction with Bill Strachan (MIC) 'Scotch on the Rocks Guiding' and it is bases out of Glen Coe. The course cost does not inculde accommodation or food. There is lots of accommodation of all types in Glen Coe, please let us know if you would like help in organising somewhere for the duration of the course. Bill was out again today with Tom and Alex, thankfully the conditions were much nicer! They headed into Sneachda and climbed Patey's Route IV,5 which was in good conditions apart from a fair bit of powder just at the crux were you traverse left and then back right! There are some big cornices above many of the routes and with a rise in temperature forecast for tomorrow it would be best to stick clear of them. Looks like another wild day in store for tomorrow, hope it is nicer in Rjukan were I am going! As I am off to Norway in a day I am spending some time at home with Laura. This means that Bill is out with Alex and Tom fore the next 3 days. The plan had been to get the guys on some more technical ground and with this in mind they had headed into Coire an T' Sneachda. However the strong southerly winds and poor vis were not making life easy. Once the rescue box had been located it was time to try and get to the base of the routes. Unfortunately this proved too dangerous due to a high avalanche risk. 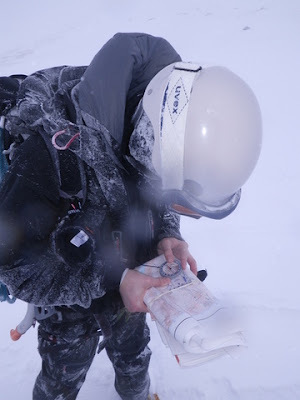 It was time for plan B which had the team looking at some navigation in challenging conditions as they headed out via the lateral moraines and back to the car. Fingers cross for some better weather tomorrow for them. I was joined today by return clients Alex and Tom. It was forecast to be wild in the Cairngorms so we headed west towards Beinn a Chaorainn. We climbed the East Ridge taking in all the hardest parts that make the route around grade II. The snow level was around 500m and above 650m it was well frozen. The cloud was fairly low and so we did not great views during the day but it was still a great day out. I am off to Norway for the next 2 weeks so will update the blog when I get back. A trip up the Ben! Bill and I were out again today with the second half of the 1st Year students from West Highland College. The plan had been to head back up the gondola at Anoach Mor, however on arrival it was on hold due to high winds so rather than hang around and wait to see if it was going to open (the winds were forecast to get stronger) we headed up to the top car park for the north face of Ben Nevis. We then headed up to the CIC hut, stopping every now and then to discuss efficiency in winter and introduce avalanche assessment. From the CIC hut we headed east to the slopes over looking the hut, here we found some good slopes to look at some ice axe arrests, movement on steeper snow, boot work and some avalanche assessment. We seemed to be around the freezing level most of the day and there was a strong southerly wind blowing all day along with the odd flurry of snow. There were lots of people out with teams in the Gultch and on the 1st two pitches of waterfall gully. A great day out and the team did really well for their first day out in winter. Today was another day out with West Highland College but this time it was half of the 1st year students. Bill and I took the team to the Glen Coe Ski Centre and used the uplift here to get high. This was a first winter day out for many of the students and what a great day out it was with no wind and blue skies. We headed west from the chairlift up onto the ridge line discussing movement top tips and introducing avalanche awearness. We then found a slope for some ice axe arrests, it took us a while to get a good sliding track working but after this was done it was great! We then finnished off the day by looking at some shelters and boot work on some steeper snow slopes. Out again tomorrow with the second half of the 1st years, fingers crossed for the same weather. I am across on the West Coast for the next 3 days working for West Highland College. Today was a winter skills development day for the 2nd year students. Bill and I took at team of 9 up the Gondola at Anoach Mor and headed around to the Nid Ridge area. We spent most of the morning discussing avalanche assessment as the snow pack was interesting after all the snow and wind during the past few days. After lunch we discussed and dug emergency shelters before developing some safe travel techniques up through some steeper ground and back to the gondola. A great day out. The snow was fairly soft in most areas and the cover was excellent with plenty of skiers out enjoying themselves. No photos from Sunday as the weather was so fowl! Simon, Dave and I quickly realised that climbing in the conditions would not be much fun so we decided on working on some navigation. This seemed a good idea with strong winds, wet snow and poor visibility. We headed out towards Lochan picking out various points on the way and working on our 3 D's before heading back to the van for 2pm. This allowed a quick coffee in Aviemore before the guy's had to catch their flight back to London. I was joined for the weekend by return clients Simon and Dave, last year we spent 3 days mountaineering and this year there were keen to try something a little harder. As we walked into Sneachda on Saturday morning it was clear that there had been a fair bit of fresh snow on the southerly winds the night before so I was a little concerned about getting to the routes and the avalanche risk. This was then confirmed as when we got into the base of the coire we could see a large avalanche trail from the top of the goat track, plus a smaller one from underneath Stirling Bomber. There were 6 people caught in these who were air lifted out. After an inspection of the avalanche debris and an examination of the slopes I headed up towards the Trident area but as I got closer to the bay it was clear the snow was not stable, however the snow underneath Spiral Gully and Wavelength area was so we headed along with many others to Spiral! The route as you can imagine was covered in deep soft snow but the neve underneath was great. We climbed it in 4 good pitches to give Simon and Dave there first winter route and we topped out in glorious sun. From the top were headed back to the car via 1141. An excellent day out and I hope those caught in the avalanche are OK.
For the last day of the course Peter, Adrian, Paul and I headed into Coire an t Sneachda to look at some more crampon skills plus some emergency techniques, whilst staying fairly low as the winds were due to be high. We navigated into the rescue box and then used the slopes above to look at some steep ground crampon techniques and discuss a little more avalanche assessment. From here we headed around to the lateral moraines and due some emergency shelters before heading up onto the ridge and back down to the van through the ski area. A great week with good company and some great weather days. With a good forecast for today we were keen to get up high, go for a journey and learn some new skills. With this in mind we headed out towards Lochain from the Cas car park. On the way we developed the navigation that we had been looking at over the last few days. On the west spur of Lochain we stopped to discuss some avalanche assessment and look at hasty pits. After this we headed up to spot height 1083 before turning north and heading over Lurchers and down to the sugar bowl car park. All the time thinking about our navigation and avalanche assessment. Conditions can only be described as brilliant in the Cairngorms today. The snow is hard and crisp and reports from the climbing teams are that the gullies are in great condition with gear being easy to find as the cracks are nice and clear. With both Peter and Adrian carrying slight injuries today we stayed low down and had a centre day to make sure they were fit for the good forecast for tomorrow. We spent the morning and early afternoon looking at navigation skills and techniques. These included pacing, timing, bearings, contour interpretation, aiming off, attack points and hand railing. Then to finish the day off we had a chat about avalanche assessment and worked through some case study examples. A good day with lots learnt and we are all looking forward to getting back on to the hill tomorrow. After the wild and windy weather of last week I was keen with the good forecast today to get up high and tick off a summit! We headed up the Cas ridge looking at some more boot work plus step cutting before putting our crampons on as the snow was frozen solid and very icy in places. We then headed up to 1141 and on to the top of Cairngorms stopping for a quick summit photo as seen above. We then headed down to Ciste Meredith which had a lot of soft unstable snow and a large cornice. From here we headed back towards the ski area and back down to the car park. It was great to be out enjoying the views and up high. The team did well to get to grips with crampon technique in some hard icy conditions. Looks like it is going to be warm and damp tomorrow before another good day on Thursday. 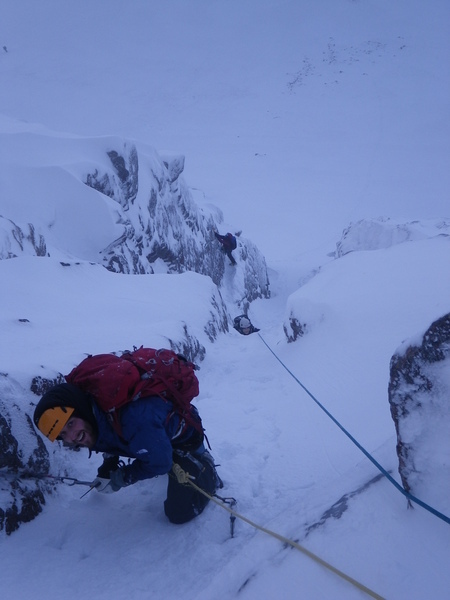 I am back at Glenmore Lodge this week for another 5 day Winter Skills Course. After our intro chat this morning and a look at suitable winter equipment we headed off up the ski road to Coire Laogh Mor..................or so we thought, the ski road was closed due to snow! After a quick chat with the friendly man on the gate he did not think it would be open for the next hour at a minimum so the decision was quickly made to park the van and walk up the road! Not quite the start to the day we had planned but actually a nice walk as it was all so quiet! Once at the Ciste car park we headed into Coire Laogh Mor were we found some fairly deep snow drifts and neve that was not quite frozen. However we found some slopes that we could look at ice axe arrests on as well as some step kicking. The wind picked up in the afternoon but thankfully the road had been cleared and we did not have to walk back down it. A good start to the week with a fair bit if fresh snow which will make safe route choice important tomorrow. There has been a fair bit of avalanche activity in Sneachda today. The plan for the last day of our winter skills course was to go for a journey and use the new movement skills, navigation and avalanche assessment to carry this out. However the weather had slightly different ideas! By 9am it was already gusting 80mph on Cairngorm and so we changed our plans to stay a little lower. After a drop off at the Sugar Bowl car park we headed into the Chalamain Gap, there was a lot of fresh snow which made the going slow but it did allow us to look at navigation and some avalanche assessment. As we got close to the top of Creag a Chalamain the winds picked up as forecast and started to blow us off our feet again! So we turned around and headed back using the same trail we had ploughed on the was in. We then followed the lovely river side path back to Glenmore Lodge were it was time for hot showers and a final good bye chat. Thanks to the team for your great company over the week and putting up with some challenging conditions, it is not always like this honest! I now have the weekend off before heading back to Glenmore Lodge on Monday for another week. Fingers crossed the wind is not so strong next week! We headed into Coire Cas this morning with about 10cm of fresh snow and clear blue skies. It was clearly windy on the tops but it was not too bad at all in the coire..............or so we thought when we left the van! The aim for today was to introduce avalanche assessment and route choice. On the way in we stopped every now and then to talk about indicators for snow movement etc and the weather was really quite pleasant. However it started to change after about an hour! Mmmmm where have the views gone! Once in the very back of the coire I was surprised to see the whole back wall totally stripped of any fresh snow, not so good for avalanche assessment! We then headed around to the west ridge were we found a deposit of windslab on a gentle angle so spent some time looking at different ways to assess stability. This spot gave us a little shelter but not much! At around 2pm we were just beginning to think about to head up to the Ptarmigan and the winds picked up. So it was a battle with the winds back down to the car park which we got just in time as the ski road was shut! Good timing to as later that day and during the night the winds were recorded at over 150mph on the top of Cairngorm. The forecast was poor for today with strong winds and a freezing level above the summits so we opted to stay low and work on our navigation. We spend about an hour in the morning inside looking at some theory and then headed out after a coffee to look at taking bearings and using pacing. After a bit to eat we headed out into the woods that surround Glenmore Lodge and used the orienteering maps to look at lots of different navigation techniques, as well as focusing on contour interpretation. It rained for most of the day but by mid afternoon the temperature had started to drop and the rain turned to snow higher up on the mountain. Looks like a stormy forecast for tomorrow but it will be cold! For day 2 of our winter skills course the aim was to look at crampon skills and all things spiky! The forecast was for some fairly strong westerly winds and so I was quite please when we were able to walk into Sneachda without being blown around too much. The snow had frozen solid over night and was perfect neve for practicing crampon work. We dropped off the path not long after it forked and headed straight on to the snow patches which we linked up as we headed into the coire using the fiacaill for shelter. After a stop for lunch it was time to head to the flat ice and develop out cramponing technique on a harder surface. Just as we left the flat ice it started to snow heavily and get a bit blowy! We then headed around the corie looking at other cramponing skills before the wind called a halt to proceedings and we headed for shelter behind the lateral moraines. It was then back over the Cas Fiacaill and down to the bus through the ski area. Another great day in some wild weather. Looks like more strong winds to come for the rest of the week!